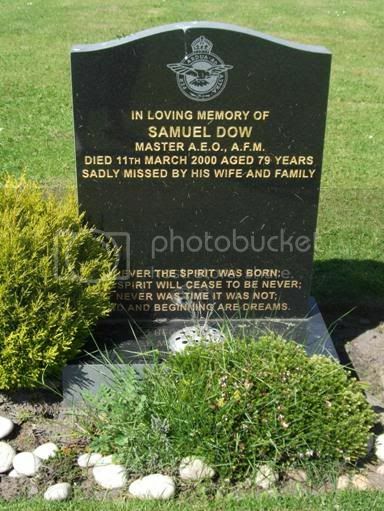 In loving memory of Samuel Dow, Master AEO, AFM died 11th March 2000 aged 79 years. 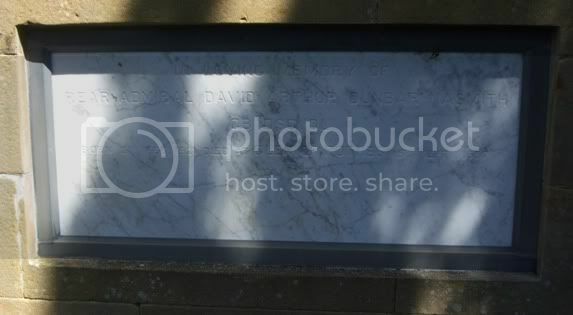 Sadly missed by his wife and family. 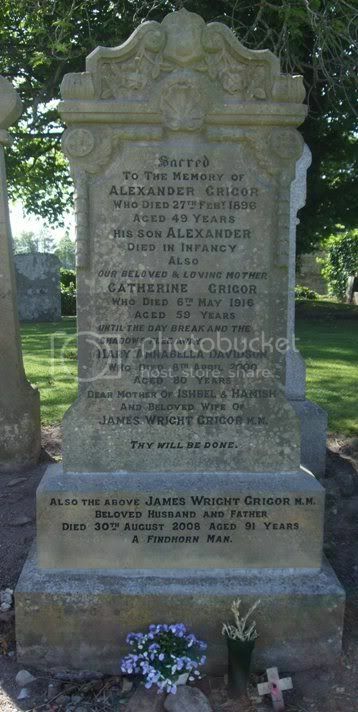 Sacred to the memory of Alexander Grigor who died 27th Feb 1896 aged 49 years. His son Alexander died in infancy. Also our beloved and loving mother Catherine Grigor who died 6th May 1916 aged 59 years. Until the day break and the shadows flee away. Mary Annabella Davidson who died 8th April 2000 aged 80 years. Dear mother of Ishbel & Hamish and beloved wife of James Wright Grigor, MM. Thy will be done. 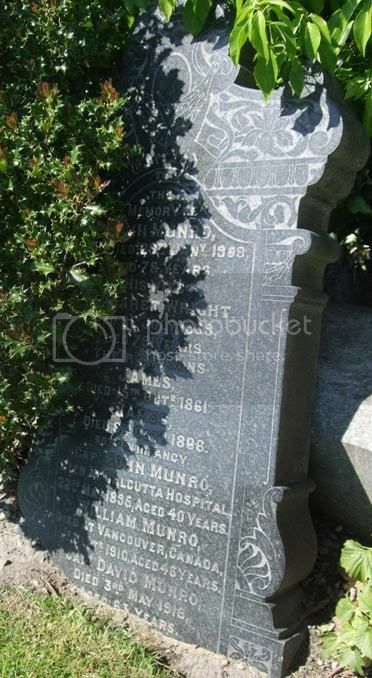 Also the above James Wright Grigor, MM beloved husband and father died 30th Aug 2008 aged 91 years. A Findhorn Man. 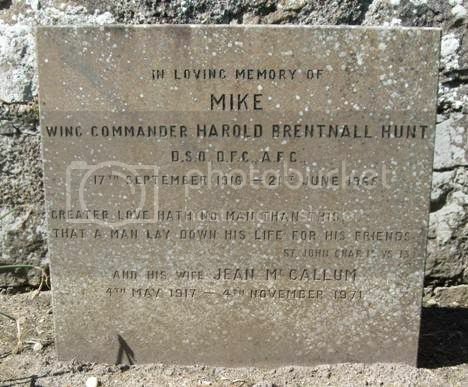 In loving memory of Mike, Wing Commander Harold Brentnall Hunt, DSO, DFC, AFC 17th Sep 1916 - 21st June 1965. Greater love hath no man than this, that a man lay down his life for his friends. And his wife Jean McCallum 4th May 1917 - 4th Nov 1971. In loving memory of Elizabeth Ann Walker beloved wife of Alexander Innes who died at Glenburgie 1st Sep 1919 aged 40. Also the above Alexander Innes, Manager, Glenburgie Distillery who died 28th April 1927 aged 51. Also his son James Alexander Innes died in Aberdeen 21st Dec 1928 aged 21. His daughter Florence Shaw Hendry died in Dairsie 15th April 1984 aged 79. Her husband George Hendry, MA Headmaster, Oyne died in Cupar 23rd March 1966 aged 63. Their son P/O George Hendry, RAF at rest Bridlington Bay 22nd April 1952 aged 19. In memory of John Munro died 28th Jan 1909 aged 78 years. His wife Margaret Wright died 9th July 1909 aged 79 years. Their 2 sons James died 15th Oct 1861, James died 6th Oct 1866 both in infancy. Capt John Munro died at Calcutta Hospital 22nd May 1895 aged 40 years. William Munro died at Vancouver, Canada 19th Sep 1910 aged 46 years. Capt David Munro died 3rd May 1918 aged 63 years. Jane Kemp wife of Capt David Munro died 22nd June 1941 aged 77 years. In loving memory of Rear Admiral David Arthur Dunbar Nasmith, CB, DSC, DL born 21st Feb 1921 died at Glen of Rothes 15th Sep 1997. 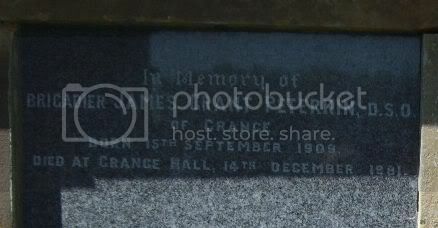 In memory of Brigadier James Grant Peterkin, DSO of Grange born 15th Sep 1909 died at Grange Hall 14th Dec 1981. To the cherished and beloved memory of Mrs Mary Ann Grant Peterkin of Grange and Greeshop. 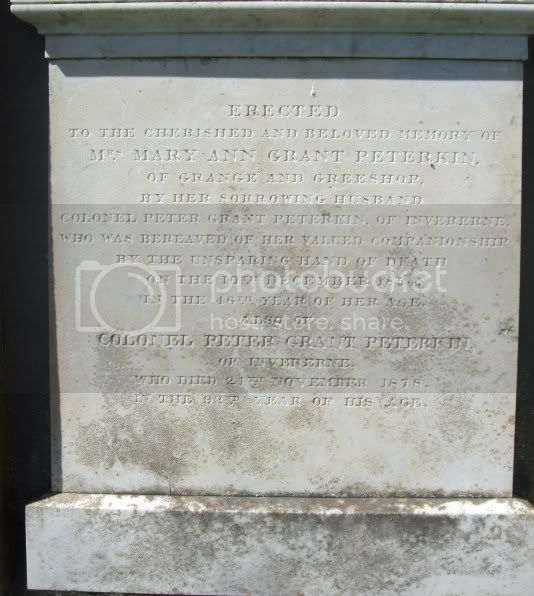 By her sorrowing husband Colonel Peter Grant Peterkin of Invererne who was bereaved of her valued companionship by the unsparing hand of death on the 10th Dec 1854 in the 46th year of her age. Also of Colonel Peter Grant Peterkin of Invererne who died 24th Nov 1878 in the 92nd year of his age. 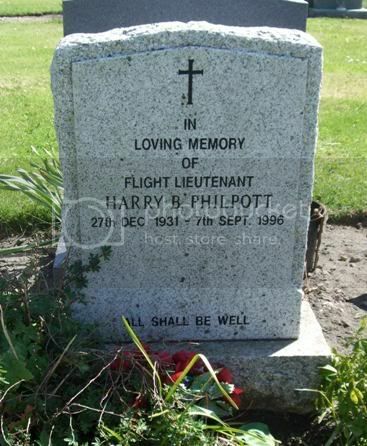 In loving memory of Flight Lieutenant Harry B Philpott 27th Dec 1931 - 7th Sep 1996. 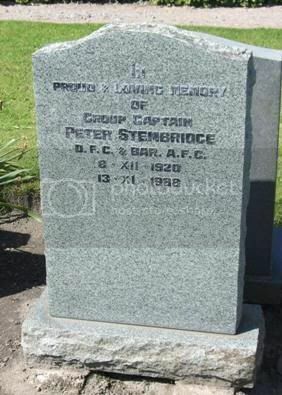 In proud & loving memory of Group Captain Peter Stembridge, DFC & Bar, AFC 8. XII.1920 - 13.XI.1988. 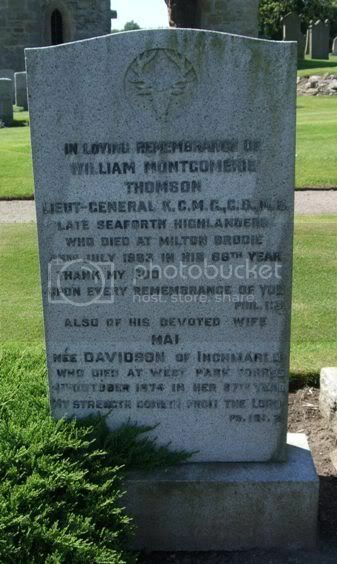 In loving remembrance of William Montgomerie Thomson, Lieut General, KCMC, GB, MC late Seaforth Highlanders who died at Milton, Brodie 23rd July 1983 in his 86th year. Also of his devoted wife Mai nee Davidson of Inchmarlo who died at West Park, Forres 4th Oct 1974 in her 87th year.